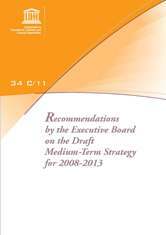 UNESCO adopts every six years a medium-term strategy, which sets out the strategic objectives and expected outcomes for the Organization’s work. 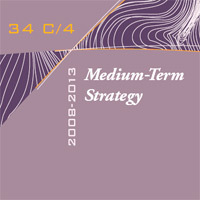 UNESCO’s Medium-Term Strategy for 2008-2013 (document 34 C/4 (PDF)480 KB) sets out the strategic vision and programmatic framework for UNESCO’s action in all its domains at the global, regional and country levels over the next six years. "As a specialized agency of the UN system, UNESCO contributes to the building of peace, the alleviation of poverty, sustainable development and intercultural dialogue through education, the sciences, culture, communication and information." v) catalyst for international cooperation. Throughout the strategy, UNESCO is determined to accord priority to Africa and to gender equality. Moreover, specific targeted action is envisaged for youth, the least developed countries (LDCs), and small island developing states (SIDS). UNESCO will further respond to the needs of the disadvantaged and excluded groups, as well as the most vulnerable segments of society, including indigenous populations. Fourteen strategic programme objectives then translate how the overarching objective will be pursued in a thematic manner and through sectoral and/or intersectoral action. Apart from the main programmatic objectives, the 34 C/4 contains sections on managing for impact; constituencies, partners and partnerships; and visibility and public information. The roadmap laid out in the Medium-Term Strategy must be translated into three consecutive programme and budget documents (C/5), beginning with the Programme and Budget for 2008-2009 (document 34 C/5).